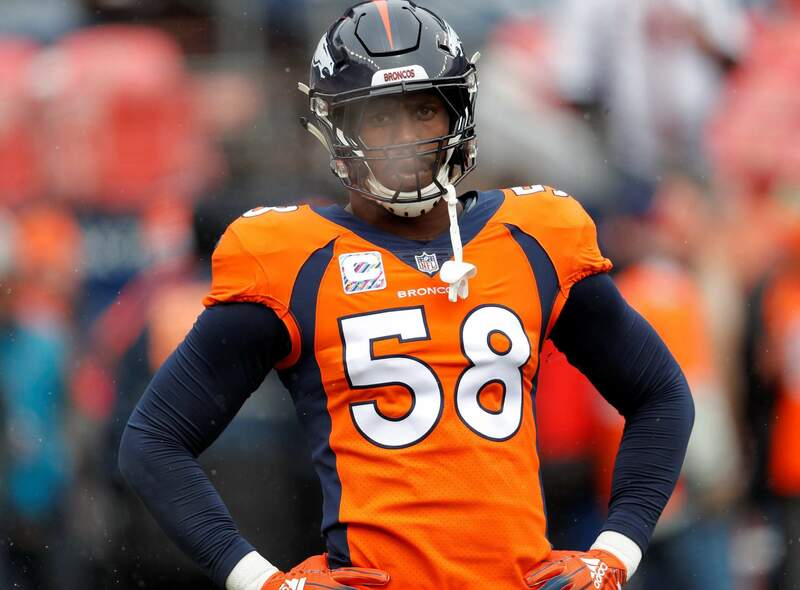 Denver Broncos linebacker Von Miller (58) warms up prior to a game against the Los Angeles Rams last Sunday in Denver. The Arizona Cardinals can’t run the ball, the Denver Broncos can’t stop the run. The ground game could be the deciding factor when the two struggling teams meet Thursday night. GLENDALE, Ariz. – The Arizona Cardinals can’t run the football. The Denver Broncos can’t stop the run. “I’ll tell you this - and I’m a firm believer in this - stopping the run and running the football allows a team to control the game depending on who is doing that the best,” Broncos coach Vance Joseph said. Arizona (1-5) ranks dead last in the NFL in total offense and in rushing, averaging 64 yards per game on the ground. Denver (2-4) is last in rushing defense, allowing a whopping 161.3 yards per game. Denver has allowed 593 yards rushing in its last two games. Two of the opposing running backs, the New York Jets’ Isaiah Crowell and the Los Angeles Rams’ Todd Gurley, topped 200 yards rushing, something that’s never happened against the same team in NFL history. The Cardinals aren’t good against the run, either. They rank 31st in the NFL, just ahead of Denver, giving up 151.2 yards per game. That could clear the way for the Broncos’ rookie running back tandem of Phillip Lindsay and Royce Freeman, who have a combined four touchdowns and average 5.19 yards per carry. But Denver has relied more on the passing of Case Keenum than in the running game in recent weeks. The Broncos have lost four straight, the latest a close home loss to the undefeated Rams. Arizona has beaten Denver only once in the 10-game history of the series. Both teams are beaten up on the offensive line. The Broncos lost their best lineman, left guard Ronald Leary, to a torn Achilles tendon against the Rams. Denver right tackle Jared Veldheer — a former Cardinal — is expected to miss the game with a knee injury. Arizona left guard Mike Iupati has been sidelined with a back injury that knocked him out of Sunday’s loss at Minnesota. Right guard Justin Pugh has his injured right hand in a cast-like wrap and plans to try to play Thursday. Miller and rookie Bradley Chubb had 4½ sacks between them last week, but Miller insisted they hadn’t unlocked some sort of pass rush puzzle. UP-TEMPOThe Cardinals’ offense, under rookie quarterback Josh Rosen, showed some signs of life with an up-tempo game late against the Vikings. Expect to see more of it against Denver. ELWAY’S CRITICISMBroncos general manager John Elway reprised his “soft” criticism he also used last year when discussing Denver’s run defense this week. Elway suggested the Broncos must realize that “we’re fighting for our lives” Thursday night. MCCOY’S HEATFor the second year in a row, Mike McCoy is feeling heat as an offensive coordinator. McCoy was fired by Joseph after 10 games with the Broncos last season. Now he’s facing severe criticism as offensive coordinator of the Cardinals.